Every now and then you come across a product that you wish you had discovered earlier, well that 's what happened to me. I came across of one of these products a few weeks ago that not only wow'd me on the first use but kept its promises. This product is my cherished Hydra Quench by Clarins. On the day of my purchase I probably spent a good 20 minutes going through every aisle at Boots looking for a really good hydrating cream that I was desperate for, my skin was dull and dry and I had to get the right product. My goal was to find one that I hadn't tried already and I have to admit I was lost among the mountains of brands and options. 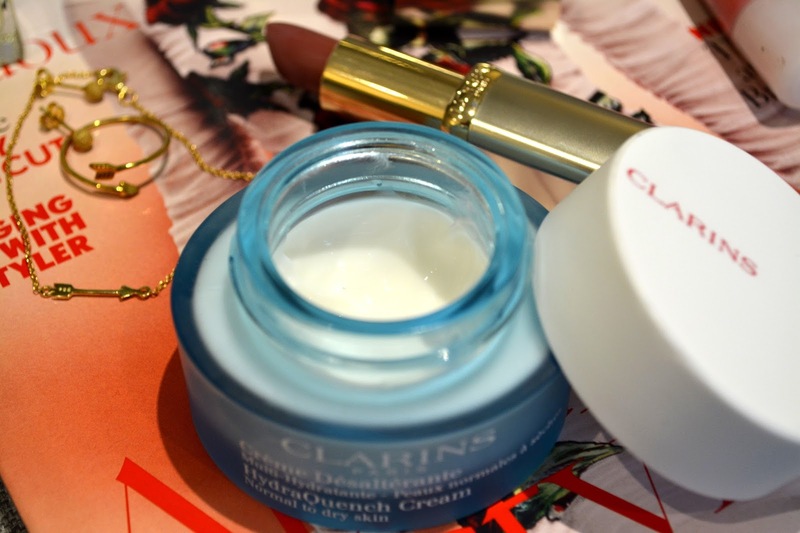 Slowly but surely my steps lead me to the Clarins counter. 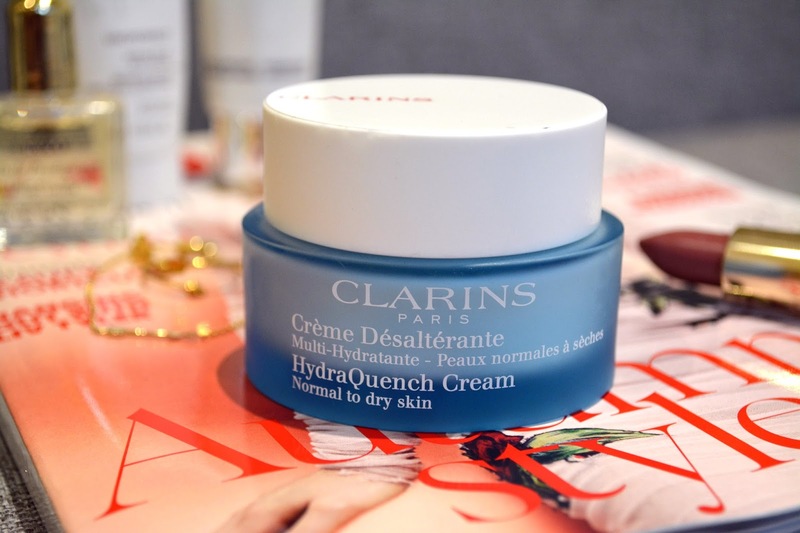 Once again I was a lost soul, as Clarins was offering a large amount of products but after a chat with the sale assistant she lead me to the Hydra Quench cream. Trusting her advice I took it home and, I should mention, with a mountain of other free goodies by Clarins. Who doesn't like free goodies, hey? And they weren't little pack samples either but proper mini cute version of their most iconic products. So here I am with a smile on my face on my way back home. I tried it on the next morning on clean but dry skin, and to my delight it delivered. The application was light and silky, it penetrated into my skin very quickly and I do not need to use a lot, a small amount was enough to do my whole face and neck and also felt very hydrating on the first application. I really dislike when I use a hydrating cream that I have to apply 2 to 3 times before feeling hydrated, usually when I come across these 'hydrating' creams they don't get a second purchase. My skin felt amazing, very moisturised and not greasy either. did I just discover my perfect hydrating cream? With no doubt: YES I did. I know this cream comes at a cost but if I think about the amount of cheaper cream I get and got disappointed with and where I had to use much more product to be just about satisfied then I feel that this product is more than worth it as it will last me longer. And yes I will be re-purchasing it again and it is already on my Christmas wish list. Also I discovered later on that this product uses many natural ingredients such as Katafray extract, Rowen tree bubs, Pomegranate, Sorbier Tree etc. All ingredient that help keeping moisture and protect from the environment. As you probably know I am a sucker for natural ingredients so I can only love this product even more. 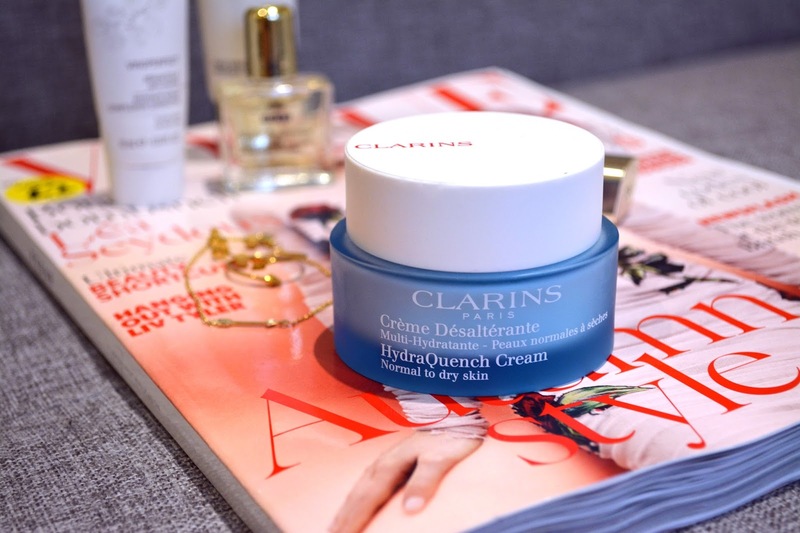 Have you used Hydra Quench by Clarins before? Or what do you think about it ? Let me know by commenting below. Thanks.